The New Zealand Cricket and Rugby Players Associations are set to be the big winners of the Black Clash, with the two to get a share of a six-figure donation. The organisations were guaranteed to receive a minimum of $50,000 each from the event, while Cystic Fibrosis New Zealand will also benefit from an in-ground collection and programme sales. The event, which pits a team of elite cricketers against a team of top-level rugby players in a game of T20 cricket, has been two years in the making, and Duco Events director David Higgins said the sums donated to the NZCPA and NZRPA would be allocated to various player welfare needs. 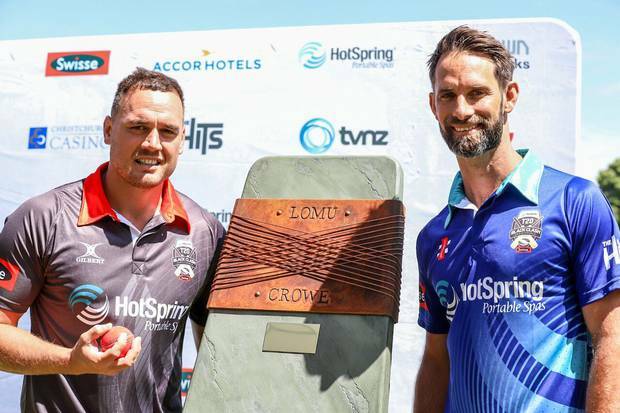 The teams will be playing for the Lomu-Crowe trophy, which was unveiled on Wednesday, amed in honour of late Kiwi sporting legends Jonah Lomu and Martin Crowe. While there had been some media backlash over the trophy, Higgins said he believed it was a fitting tribute to the iconic talents. "Both Martin and Jonah were men whose achievements transcended the sports field," he said. "So to be able to honour them even in a small way by naming the T20 Black Clash trophy the Lomu-Crowe trophy just feels right." Among those taking part in the game are former Black Caps captains Stephen Fleming and Brendon McCullum, current All Blacks Beauden and Jordie Barrett, and current Black Fern Kendra Cocksedge. Both NZ Rugby and NZ Cricket have given their blessing for players to be involved. With the Black Clash being a commercial event, every entity involved is being compensated for their time and effort, including the players taking part in the match. "From the suppliers, the contractors, we're paying tax to the New Zealand Government, the employees involved," Higgins said, "and the players making themselves available are getting a small amount. It certainly doesn't represent their time. "The beauty of it is everyone wins." This month's event will be the first time something like it will be run in New Zealand, with similar styled matches being held across the world in the past. It was the product of some brainstorming between Higgins and Fleming. "We managed to get the commitment of the players associations and they managed to get commitment from some very big names," Higgins said. "I think the players are genuinely excited about going toe-to-toe in that format and genuinely competing." The event will take place at Christchurch's Hagley Oval on January 25. Kieran Read (c), Richie McCaw, Israel Dagg, Beauden Barrett, Jordie Barrett, Aaron Smith, Jason Spice, Ali Williams, Kendra Cocksedge, Kaylum Boshier, Ofisa Tunu'u, David Hussey (wildcard). Coach: Sir Graham Henry.